There was a time when trade was a slow-moving tanker of a topic – what we, at New Internationalist, would call a ‘solid development issue’. Not in these times of Brexit turmoil and a Trumpian trade war with China. As we go to press, there is little certainty about how events will pan out over the next couple of hours – let alone months. 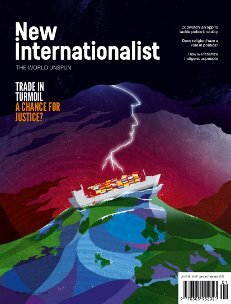 In this magazine we delve into the thicket of global trade – interviewing and consulting experts and campaigners from around the world. Our aim is not just to make sense of what’s going on, but also to dig into what’s missing from the blow-by-blow reporting in the media; to examine the underlying causes of the current crises; the important impacts of the free-trade system that just aren’t being discussed; and the implications for citizens in countries that aren’t powerful players on the world stage. And, in true New Internationalist fashion, this issue does not stop at reporting what is – but goes the extra mile to envisage how things could be with a 14-point plan on what a better, fairer, more sustainable trading system might look like. Mark Engler reflects on the life of Pete Seeger - an American musician, patriot and dissident. Malcolm Lewis reviews Burning, directed and co-written by Chang-dong Lee; Green Book, directed and co-written by Peter Farrelly. Here today, here tomorrow - Nanjala Nyabola questions Cameroon's never-ending presidential terms.